Buy a new Mustang automobile at Raceway Ford and get a 2015 Mustang art print absolutely FREE! Mike Correra aka “Mike the car guy” is the man you want to see! Go to Raceway Ford and purchase America’s favorite pony car! You’ll also get a genuine Danny Whitfield mustang art print with your purchase. Page one in this year’s holiday gift guide, The 2015 Raceway Ford “Special Edition Mustang! Available for a limited time only. Danny Whitfield already has a print for the lucky owner of this Special Edition Mustang! Many folks will be buying Pony’s for the holidays but only ONE will take home this special ride! And while your at it see Raceway’s Special “Edition Mustang” GT on sale now! This entry was posted in Car Art - Automotive Art of Danny Whitfield and tagged 2015 mustang, art print, car art, Danny Whitfield, Ford Mustang, mustang art, poster, Raceway Ford dealership. I hope you Mustang guy’s and gals are proud of me. I had an opportunity to do a skype interview for the TV program Lets ask America! I was interviewed by host Tiffanie Nguyen about my Mustang art and the all new 2015 Mustang Automobile. The interview was at Raceway Ford in Riverside California with my friend and fellow car guy Mike Correa – aka “Mike the car guy!” We had a blast. Remember how I mention you can get a free Mustang art print with your purchase of an actual mustang automobile? Well that’s what got the party started! We wanted all the Mustang fans on Facebook to know your a part of this too! How? by the past sales of my customers and the excitement of the Ford Mustang past present and future. The actual show will air at a later date and I will show here on Facebook via You Tube. Also just to let you know I will have the 2015 Mustang art available in about a month and will make special edition prints commemorating the first 100 cars. Those that want their Vehicle Identification Number on the prints just let me know. This entry was posted in Car Art - Automotive Art of Danny Whitfield and tagged #2014 mustang, #ford#mustang, 2015 mustang, ford, mustang, Raceway Ford. Here’s the plan, In addition to your customer purchasing a brand new Ford Mustang – They can receive a high quality art print of the car signed by Automotive Artist Danny Whitfield! He will personally signed it, the buyers name or any other insignia of their choice. Danny is fully licensed with the Ford Motor Company image division and is privilege to create art of the magnificent Mustang. The dealership would order the print from Danny’s website and build the price into the sale. Doesn’t matter if it’s a V6, a GT or the mighty Boss 302 they get to drive away with a master piece to proudly display at their home, office, car event, man cave or garage. They get the same body color and wheel options in the print to match their car not a generic Mustang. Plus it’s the work of an artist not a common photo. Click here to see his complete inventory! And take a look at what Raceway Ford in California is doing with “The Automotive Art of Danny Whitfield” Click this link to see for yourself! A special gift of art will forever remind them of a joyful car buying experience at your dealership! They can also choose any year Mustang from 1965 through 2015 as the artist inventory’s covers all years. The customer is privileged to get Mustang year of their choice. It’s hard enough to resists looking at a new car in the garage but seeing it hanging in the office is the ultimate show stopper. So how do I go about getting the media kit for my dealership? You simply order the kit from Danny Whitfield. Call 520-297-9104 or email to : info@dannywhitifeld.com The kit is $75.00 and will come with one 16 x 20 size poster similar to the one shown in this post, one 8×10 size – one-5×7 size – and 4 wallet sizes to display throughout your dealership. If you want your dealerships logo and name exclude in the poster – just send a high resolution Jepg or Gif image and it’s as good as done. What your customer gets in return is a high quality 16 x 20 art print with the extra’s sizes completely free. One 8×10 size – one-5×7 size – and 4 wallet size. All free with the purchase of the Mustang Automobile. You just can’t beat that for value! We all know car shows are part of the excitement when owning Mustang automobile. They get bigger and bigger every year. When your customer sees his baby caught in still life he gets that over whelming joy of show off his cars natural beauty. All of his friends would see his “prized stallion” and your dealership becomes the “go to” place for Mustang sales! Get the jump on your competition with a bonus gift that makes you stand out! 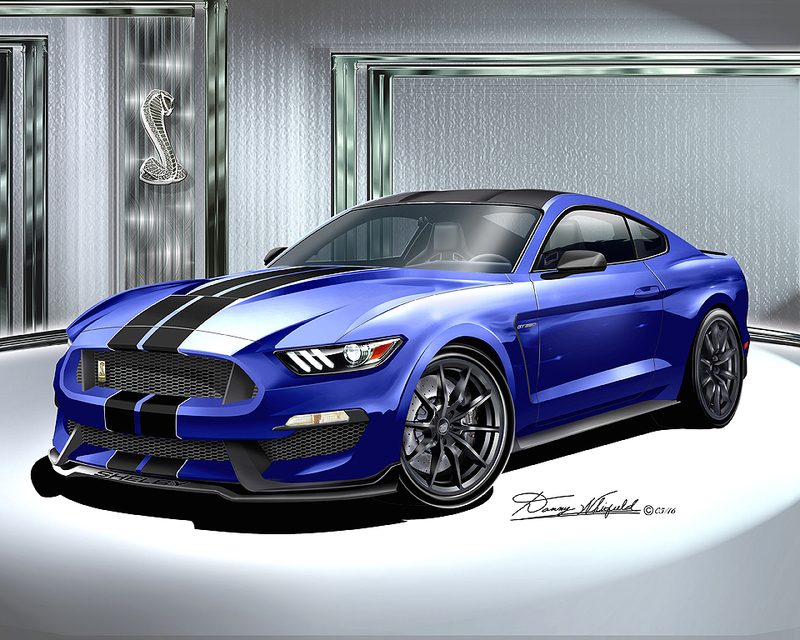 This entry was posted in Car Art - Automotive Art of Danny Whitfield and tagged 2015 mustang, Ford dealership sales managers, ford dealerships, ford motor company, Ford Mustang, ford mustang sales.